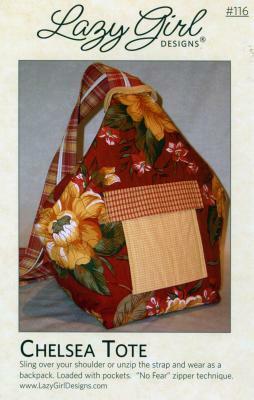 The Chelsea Tote pattern offers a wonderful combination of a tote bag & a backpack. She's a little of each with a whole lot of personality! Measuring 14" tall with an 8" square bottom, you can wear her over your shoulder with one strap or unzip the strap & she's a backpack. Easy zipper installation. Cinch her closed by pulling the shoulder strap through the loop & you're ready to go! The pattern is straight forward and easy to follow. I have made this pattern for myself as well as helped friends make one. I have chosen to not follow some of the pattern i.e. The flap on the front pocket and the zipper on the strap. I love all the inside pockets and how the bag closes. It makes it super easy to open it when your looking for items in your purse.